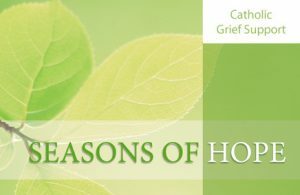 A faith-sharing group for those who mourn, Seasons of Hope has 4 six week “seasons” that offer Christ-centered material using through scripture, prayer, reflection activities, and faith-sharing. This program is in Catholic parishes across America. For information and to reserve your seat for upcoming sessions, go to “Contact Us” all submissions go directly to the parish office.